A trip to Penang is never complete without a trip to Gurney Drive. Just about every type of Penang-speciality dish can be found here, from the ubiquitous char koay teow to ikan bakar, muachi, rojak, oh chien and lor bak… and every bit of it mouthwateringly delicious. Sure, there may be better versions of char koay teow, prawn mee or rojak elsewhere, but the offerings at Gurney Drive is more than deliciously adequate and the convenience of having it all in one relatively small area is absolutely worth it. For ease of parking, just park in Gurney Plaza which is right next to the food stalls area, and to get the quickest and most fuss-free experience out of this place, bring small change of RM1, RM5 and RM10 notes with you. Average price per dish is approximately RM5. 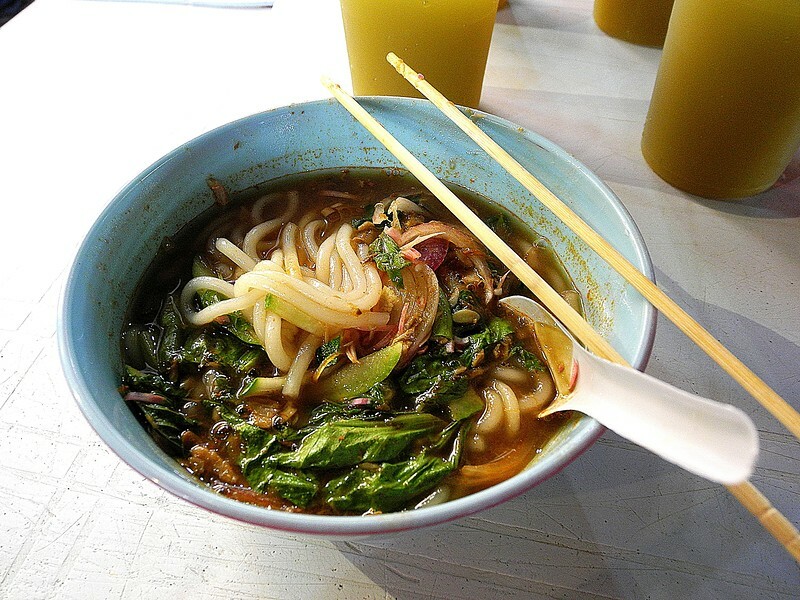 The famous asam laksa which you can taste in Gurney Drive. We were there early, around 6+ pm on both Saturday and Sunday nights. Not crowded at the hour so we can move and sit near the stalls where we ordered our food. We sit at the table in front of the stall then ordered the food. Finished then moved to another table and ordered from another stall. Even then, the rojak stall owner still asked if we were seated nearby and decided to give us the rojak on disposal plate as she cannot determine if the table where we’re seated is within the stall’s allowed territory. Like the banana apom, muah chee and rojak. Char Kway Teow and Lok lok are over-rated. Closed when I passed by on Tuesday. 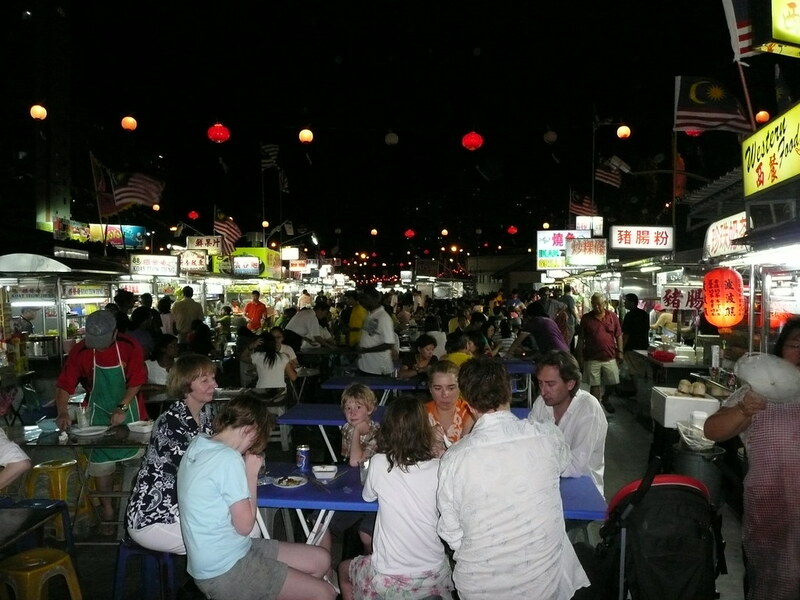 The hawker stalls at Gurney Drive. I was a little surprised that the reviews of this place are so mediocre. Sure, it was quite full and I also noticed the beggars, but I never felt uncomfortable. 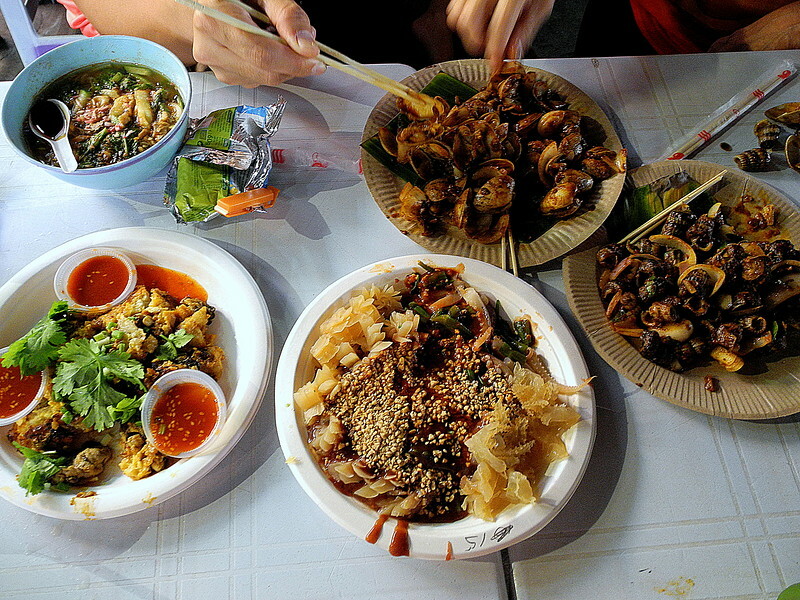 There are plenty of choices in terms of local food at Gurney Drive. All I can say is that this place is an explosion of smells and flavors of Penang. First thing you need to do is get there early for dinner. Start around five’ish or you’ll be battling for seats, especially if you arrive in a large group. Everyone sits on rows of tables surrounded both sides by local fare or all sorts. Take turns to reserve the seat while others head out and buy whatever. Portions are usually small so sampling everything is quite possible. If you’re there solo, buy a drink at the fruit juice stall and ask them to help you reserve while you hunt for what you want. I’d recommend the sour and savoury Penang Laksa, cuttlefish with veg, char koey teow (fried flat white noodels with egg) and whatever your eyes and nose fancy while you’re walking around. If your nose gets hit by overly spicy smells, no worries, just ask for less spicy so you still get a chance to sample everything. Oh..and the food is really cheap. Very wallet friendly. Dress in cool comfortable clothes cos it does get warm and don’t wear white cos the seats aren’t too clean and you don’t want to have to deal with stains as you gorge yourself on the best food around. I heard about this place from local recommendations… I was looking for somewhere to try all the local essentials in one location… like Asam Laksa, Char Kway Teow (with duck egg), satay etc… And I really wasn’t disappointed. Tons of variety, bristling but efficient service, lively atmosphere, and… above all… absolutely delicious food. We visited at about 10:30pm on Saturday night and the place had the perfect amount of visitors… enough to make it feel truly alive but not so crowded to cause difficulty with seating. And all the stalls were still open. From everything I’ve read, this seems the best time to visit. I was so surprised and saddened to read about the awful experiences described here on Trip Advisor. I’m so thankful I didn’t experience anything like that. Actually, Gurney Hawker was one of the highlights of my visit to Penang. But, after reading about others experiences, I’ll approach it with more caution during my next visit. Think hawker food, think Persiaran Gurney! Persiaran Gurney is also referred to as Gurney Drive. Most Penangites called Gurney Drive a millionaire’s row seafront promenade due to the fact that it’s a 2km seafront promenade lined with cafes, million dollar condominiums, 5 stars hotels and high class restaurants. For a detail description of Persiaran Gurney, you can visit this page here, Gurney Drive Tourist Guide. Stunning views of the sea, sunset and the cool sea breeze are the other draws. For a great shopping experience, Gurney Plaza offers four floors of upmarket retail outlets. There are also restaurants, open-air cafes, a food court and a supermarket. Kompleks Makanan Persiaran Gurney or the Gurney Drive food court, located near the Jalan Concordia/Persiaran Gurney junction, is one of the most popular places for halal food. A recommended stall is Edgecumbe Road mee goreng, run by Haji Kamaluddin Mohamad Ibrahim who used to operate in Jalan Edgecumbe. Apart from the usual ingredients, he also offers optional items such as beef lung, fish roe and squid. Pasembur Rojak Edgecombe Road, operated by Mohd Nasser Sultan is another popular stall. Persiaran Gurney is a must visit tourist destination especially for expats and non local people. If you haven’t visited this place yet, your trip is considered incomplete or you haven’t seen everything of Penang yet.